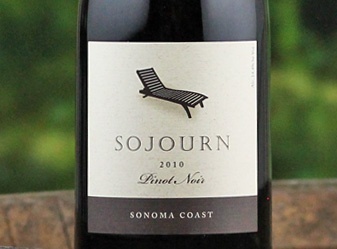 I was first introduced to wines from Sonoma’s Sojourn Cellars a few years ago at a 2013 “Pinotfest” event in Pasadena. After tasting pinot noir selections, a representative asked, in a soft voice, if I was ready to try their “dark pinot,” which turned out to be my introduction the 2009 Sojourn Cellars Cabernet Sauvignon Home Ranch Vineyard($48)that I described to be as opulent and complex as many of the $100 Napa Valley cabernets. I have continued to participate with Sojourn Cellars and they have since added chardonnay to their menu of pinot noir and cabernet sauvignon. While picking up my Fall order at the quaint tasting room off the historic Sonoma Square, I arranged to taste the new releases and discover more of their history. Arrowhead Winery, partnered to pursue their passion for pinot noir and, more interestingly, their desire to produce small bottling of cabernet sauvignon through sources at a few of Napa Valley’s prestigious vineyards. 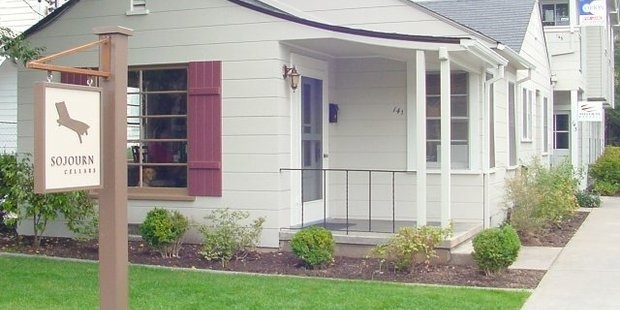 Their first cabernet sauvignon release was 2001, followed by the 2003 Sojourn Cellars Pinot Noir Sangiacamo Vineyard. They now produce nine different single-vineyard pinot noir wines, four cabernet sauvignon and, in 2011, released their first chardonnay. Today, their annual total production ranges from 6,000-8,000 cases, concentrating on new vineyards to expand their profile with the three varietals. Sojourn has “by appointment only” tastings most days and it is an ideal setting and format for small groups serious (or not) about good wine. Today, I met up with Tasting Salon Manager Sarah Congress to taste new wines, including some that I was picking up. Having concentrated on their pinot noir and cabernet sauvignon, my first opportunity to taste some of their chardonnay releases was at hand, a varietal that has recently grown in my modest inventory. All four wines are cool-climate “chards” from the Sonoma coast appellation. Carefully chosen clones from three prominent Sonoma Coast vineyards contribute to the crispy 2012 Sojourn Chardonnay Sonoma Coast ($38), spending eight months in oak barrels, 30% new. Pressed whole cluster, this vintage has soft stone fruit and apple flavors with a nice acidity that earned a 90 pt. rating from Robert Parker’s Wine Advocate. From the same vineyard as their outstanding pinot noir, the 2012 Sojourn Chardonnay Sangiacamo Vineyard ($45), also pressed whole cluster, delivers pleasant melon and citrus on the nose and a splendid minerality to the palate. It has a rich fruit character and mouthfeel and a 91 pt. rating from Parker. Based upon the reputation of the vineyards, I purchased two new single-vineyard chardonnay in my Fall allotment. About to taste them, I can now determine if my instincts were true. The Durrell Vineyard, in the Sonoma Coast appellation, has sourced grapes to some of the finest chardonnay producers in California. The inaugural release 2012 Sojourn Chardonnay Durrell Vineyard ($48) was pressed whole-cluster with full malolactic fermentation before resting sir lie in 40% new French oak barrels, bearing the opulent touch of a classic California chardonnay. With only 175 cases produced, the début 2012 Sojourn Chardonnay Campbell Ranch Vineyard ($45) has all the fine qualities expected from this cool-climate, low-yield vineyard that manages large variations in temperature that produce complex aromas and flavors of melon, tropical fruit through a lush texture. I savored both wines and I’m feeling good about my instincts. Much of Sojourn’s pinot noir comes from cool-climate vineyards along the Sonoma Coast that, along with the Russian River Valley, constantly yield some of the world’s best. The next four wines of our tasting were from vineyards within these appellations that turns out so many world-class pinot noir releases. The most classic, and possibly my favorite, the 2012 Sojourn Pinot Noir Rogers Creek Vineyard ($59),comes from an elevated vineyard in the Sonoma coastal hills above the Petaluma Gap. Nice vanilla and cinnamon on the nose foreshadowed dark fruit and hints of spice through the finish. In the remote hills, above the Sonoma coastline lies a low-yield vineyard, known for years of quality farming that is the source for the 2012 Sojourn Pinot Noir Ridgetop Vineyard ($59), a wine with pepper on the nose, concentrated fruit flavors and a silky texture that extends throughout the finish. The grapes are di-stemmed prior to open-top fermentation and are highly influenced by thirsty new oak. A right turn at the intersection of River and Wohler Roads drops you into the heart of the renown Russian River Valley appellation near Forestville. Less than one-half mile ahead is the origin vineyard for the 2012 Sojourn Pinot Noir Wohler Vineyard ($48). A bit austere, this wine has more earthy qualities with nice expressions of fruit and spice that should “open-up” with an hour or more decanting. Yet another vineyard in the coastal hills, surrounded by redwoods, produces, according to winemaker Erich Bradley, “The best fruit I have ever tasted.” Since I was taking home a bottle of the 2012 Sojourn Pinot Noir Campbell Ranch Vineyard ($59), his statement caught my attention. As advertised, I found it to be the most aromatic of the pinots with nice tannins, cherry dominant flavors and texture, drinkable today, yet rewarding patience. Not being able to taste the 2012 Sojourn Pinot Noir Sangiacamo Vineyard ($54), their original, most elegant and highly rated wine, was a disappointment, but left me someone to discover on our next visit. Enthusiasm for Sojourn Cellars Pinot Noir is also shared by the experts. 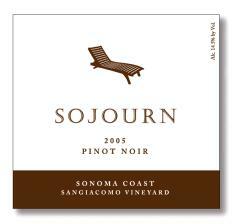 The PinotReport, a Sonoma-based newsletter has consistently rated Sojourn’s pinot’s from 92-96 points. 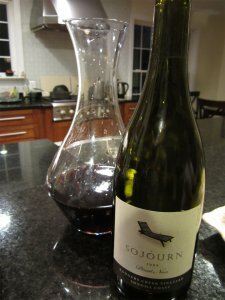 In a crowded arena of big high-end pinot producers, Sojourn can certainly compete in both quality and cost. Next, we moved to a couple of reasonably priced Napa Valley cabernet sauvignon wines including the sold- out 2012 Sojourn Cabernet Sauvignon Georges III Rutherford that was fruit-forward with hints of blueberry and cocoa on the finish. The 2012 Sojourn Cabernet Sauvignon Spring Mountain District ($59), from the hills above the town of St. Helena, was a very nice surprise with complex aromas and flavors of vanilla, cassis to accompany the dark fruit that has, to employ an overused term, a nice, long finish. 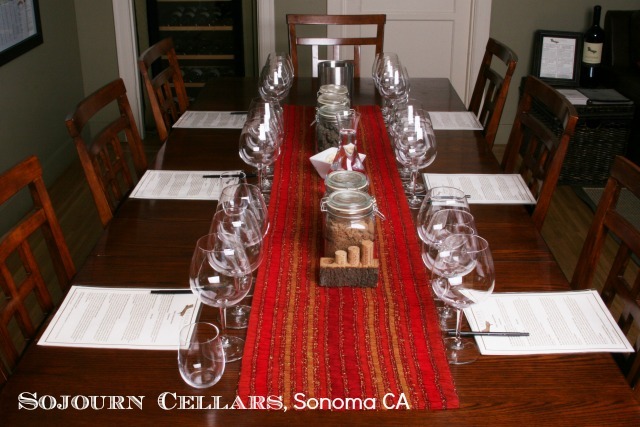 All and all, the Sojourn Cellars tasting experience is extraordinary. A picture perfect setting, a personalized tasting, at tables with proper glasses and, of course, the previously described fine wines are in store for any group of wine lover’s. The opportunity to add a nice meal on the Square makes the day a sojourn not to be missed. This entry was posted on Friday, November 7th, 2014 at 3:12 am	and tagged with Pinot Noir, Sonoma, Sonoma Coast and posted in Uncategorized, Wine. You can follow any responses to this entry through the RSS 2.0 feed.